Another PPTQ last weekend saw me again go 4-2 with Monkey Grow. I beat Jeskai Control, Affinity, and two Burn decks, dropping matches to Delirium Jund and Bant Eldrazi. The matches were interesting, but I’m wary of writing too exclusively for one niche. So I’ll spare you the tournament report and unveil a new brew: an especially ferocious take on Death’s Shadow Zoo. Death’s Shadow Zoo has been putting up serious numbers this season, and recently solidified its Tier 1 status. The deck has a number of things going for it that I like a lot, including efficient threats and a penchant for straining every resource. But I can’t stand how linear it is. After playing a few matches with a standard list, I wondered if there wouldn’t be any merit to slowing the deck down to include more disruption. We’ll start with the list and concept, then move into a discussion about the pros and cons of Death’s Shadow Blue over traditional builds of Death’s Shadow Zoo. At the end of the article, we’ll compare Death’s Shadow Blue to one of my older brews. Death’s Shadow Zoo spends its life points recklessly to grow its Avatar. The life points aren’t wasted, either. They go to the manabase, allowing the deck to consistently access its four colors, and to deck size, allowing the deck to run a functional 48 cards between Gitaxian Probe, Mishra’s Bauble, and Street Wraith. In the traditional four-color build, less life points remain to go to disruption. Thoughtseize is a mainboard staple, but the disruption mostly stops there. Playing fewer colors gives us more life points to work with, and opens up the possibility running a set of Dismember in the main. Thoughtseize and Dismember give us great ways to remove cards from the hand as well as creatures from the board, and Stubborn Denial fleshes out the disruption suite as an efficient stopper for spells on the stack. Ferocious is pretty much always live in this deck, and costing just one mana proves ultra-relevant with Death’s Shadow. With some cantrips thrown into the mix, turn one Thoughtseize, turn two Death’s Shadow plus Denial is an opening few decks can tangle with. Of course, this new build isn’t necessarily better than the already-proven Death’s Shadow Zoo. But I think it’s different enough to stand alone from that deck. Our bad matchups improve. Since they output so much damage so quickly, Burn and Affinity are notoriously difficult for Death’s Shadow decks to beat. But Burn has a lot of trouble beating Tarmogoyf, and we essentially play 12 in this deck. Stubborn Denial also gives the deck a hard time. Putting the nail in the coffin, we play so many ferocious threats that Feed the Clan becomes a hyper-reliable answer to the Lava Spike deck after siding. Affinity struggles to slog through too much disruption. 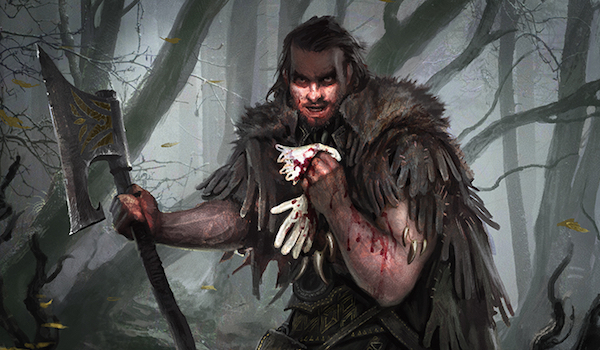 Standard Death’s Shadow decks play a pair of Bolts in the main, but any Modern grinder knows that’s not enough. Post-board, it hopes to draw into one of a couple copies of Stony Silence. Death’s Shadow Blue ups the ante with a full set of Gut Shot in the sideboard and four Dismembers main. With this removal suite, winning the Affinity matchup becomes trivial, especially considering that Traverse can grab Snapcaster Mage to flash back a Natural State. Gut Shot also teams up with Dismember to wreck synergy-based aggro decks like Kiki-Chord and Merfolk. Combined, the Phyrexian-mana removal spells make it close to impossible for creature decks to overwhelm us on the board, despite our lowered threat count. Lastly, interactive combo decks become much easier to beat with Stubborn Denial. Decks like Bring to Light Scapeshift, which play a host of effective answers against Death’s Shadow Zoo’s creatures and a combo finish, can’t actually beat one-mana Negate. Our good matchups remain favorable. We’re still much faster than Tron, and the addition of Stubborn Denial excuses a lowered speed against other linear combo decks. Attrition matchups even improve, since our threats are more resilient to removal than Wild Nacatl and Monastery Swiftspear. Getting hit by Inquisition of Kozilek on the draw still hurts, but having a hard, one-mana answer to Terminate, Path to Exile, and Liliana of the Veil gives us added game against opponents looking to interact. Interestingly, Dredge gets slightly better on the play and slightly worse on the draw. A turn one Denial can throw that deck way off-kilter. Unfortunately, the card does a lot less once Dredge gets going, and we’d rather our blue spells simply be Temur Battle Rage at that point. Goyf and Shadow still put in a ton of work here, and Cage from the board helps turn the matchup in our favor. We have better mana. Classic builds sometimes scoop to Blood Moon. Their insurance against the enchantment is to get way under it, landing Nacatl, Swiftspear, or Shadow before opponents are able to tap out for the clunky hoser. But this plan doesn’t account for opponents interacting each turn. Against openings of Bolt-Leak-Moon, Death’s Shadow Zoo is dead in the water. And that’s to say nothing of Vapor Snag and harder removal. 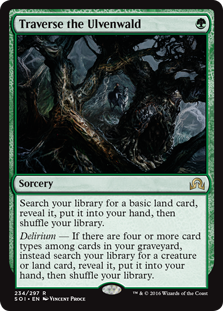 Traverse the Ulvenwald makes Moon into a total non-issue, helping us search out basic lands even after the enchantment resolves. Denial also excels at countering the hoser, which will pump our Goyfs from the grave to boot. Playing only three colors also allows us the luxury of not taking three damage every turn for making a land drop. We can fetch out our basics and cast spells on the cheap if we need to. Against aggressive decks built to pummel our life total anyway, having this option can prove very useful. Death’s Shadow Blue is slower. Something like three turns slower, and sometimes more. Sure, we get to interact a lot. But we can’t goldfish turn two victories like Death’s Shadow Zoo. Against decks that sneer in the face of interaction like Tron or Bant Eldrazi, slowing down puts us at a disadvantage. As long as we make sure we can still beat those decks, though, there’s nothing wrong with taking things slow. We’re still ahead of Tron on speed, and countering land search effects or Karn Liberated with Stubborn Denial can put slower games away. Gut Shot and Dismember prove their worth in the Bant Eldrazi matchup, where they eat pretty much everything on the other side of the table while Tarmogoyf goes to town. Our speed greatly affects our mana. Even with a set of Traverse in the deck, we play an 18th land to accommodate Tarmogoyf and Grim Flayer. Since we’re more interactive than regular Death’s Shadow Zoo, our games are bound to go longer, and making land drops isn’t such a terrible thing. All that explaining aside, Modern is an extremely fast format. I may have just listed the reasons I don’t think losing speed is the end of the world, but there’s an endless supply of arguments for the opposite stance. The main draw to Death’s Shadow Zoo is its speed, so I’m considering this point a con. We have trouble getting over certain boards. Like Infect, Death’s Shadow Zoo can overcome pretty much any board state. The combination of trample or unblockable-granting effects and heavy-duty pump spells make blocking a losing proposition against a Death’s Shadow Zoo opponent with a full grip. The major player here is Temur Battle Rage, which Death’s Shadow Blue doesn’t run. We have plenty of available pump spells in green, but none are as efficient as Temur Battle Rage, and none mesh very well with our non-blitz plan of keeping opponents off their game. Mutagenic Growth, my favorite pump spell in Death’s Shadow Zoo, doesn’t fit very nicely into this deck, since our threats all already resist Lightning Bolt. A big draw to playing that card is its ability to double as Mental Misstep against Modern’s best removal spell. How does Death’s Shadow Blue beat Ulamog, the Ceaseless Hunger? Well, it doesn’t. These kinds of creatures are road blocks we’re simply not equipped to deal with. My counter-argument for this concern is that Ulamog doesn’t show up that often on the other side of the table, since we’ve (hopefully) killed opponents by the time they hit ten mana. That said, Temur Battle Rage is sorely missed against streams of chump blockers. Lingering Souls is public enemy #1 for this deck. Grim Flayer can trample through them, but a suite of four Spirit tokens will trade with the bloody human. Another key omission is Become Immense. This instant combos with Battle Rage to provide a quick 20 damage, so it makes some sense not to include it in a deck without red. The main reason not to play Become Immense, or many delve spells in general, is that it clashes with delirium. We want Traverse the Ulvenwald and Grim Flayer online for the whole game, so these spells are off-limit for us. Graveyard hate hurts us more. Death’s Shadow Zoo has a very elegant answer to Rest in Peace: ignore it. Monastery Swiftspear, Wild Nacatl, and Steppe Lynx could care less about the graveyard police, and will all punish opponents for spending their precious second turn on a spell that doesn’t interact with them. Conversely, Death’s Shadow Blue has only its namesake creature to lean on should Rest in Peace hit the board. And 2/2 Grim Flayers, but those don’t really count. Compared with Death’s Shadow Zoo, This softness to grave hate is the biggest strike against the new brew. In a metagame where everyone expects Dredge, sleeving up Grim Flayer over Monastery Swiftspear is a huge liability. In terms of roles, playstyle, and tempo, Death’s Shadow Blue plays a lot more like an interactive blue aggro deck than like the combo-kill-focused Death’s Shadow Zoo. My primary concern after some testing with wasn’t whether the deck was a worse Death’s Shadow Zoo, but whether it was a worse Counter-Cat. The two decks attack in similar ways and suffer from a set of common problems: they take a lot of damage and they’re soft to mana denial strategies. Counter-Cat has an obvious benefit over the air-stocked Death’s Shadow Blue in that it can run more versatile cards in its four colors, allowing it to change roles fluidly between games. On the other hand, Death’s Shadow itself is a far scarier threat than Wild Nacatl against any deck with Lightning Bolts. So in a Bolt-heavy metagame, I think I would prefer to leave Wild Nacatl at home. Interactive blue aggro decks don’t have the speed of Become Immense + Temur Battle Rage, and they probably shouldn’t (although they once did). That’s the reason we’re seeing Death’s Shadow Aggro perform without Stubborn Denial, and decks like Counter-Cat benched in favor of linear takes like Gruul Zoo. Speed is at a premium in Modern. To echo a concern raised by many over the triple GP weekend, Modern might be a format that so rewards speed and linearity that playing blue-based interactive aggro decks becomes a losing proposition. I like playing Magic, and forcing my opponents to play Magic. But Modern has long been a format of questions, not answers. It’s possible the very process of turning a linear deck into an interactive one makes it weaker. What do you think? Let me know in the comments. Previous Post: Triple GP Analysis! Great article! What are your thoughts on the Grixis version of Death’s Shadow? It seems to have both the speed and disruption that you are looking for. Gurmag angler makes use of the used up spells in the yard, and playing kiln fiend allows you to play mutagenic growth. Best of all, you can play temur battle rage! I’m curious, because I’m considering investing in the archetype and wondering what will be the most fun version.